Today’s class was run by a visitor, Professor Sung Jang. The focus was on filming, video editing with Premier Pro, and audio recording. We began with a review of well-made Kickstarter videos and previous videos of design student work created by Professor Jang. The class had the chance to participate in a real-life demonstration of filming one of our classmates and observe Professor Jang edit the video in real time. A key takeaway for me was that our impressions of video are half derived from visuals and the other half are derived from audio. This means that audio needs to be recorded separately and given just as much attention as constructing and editing the visual content of a video. It’s also important to have someone else listen to your audio and give you feedback along the way, particularly if you are recording your own voice. This, along with many other reasons, is also why it helps to have a “video-making team” who can be physically supportive as well as constructively critical throughout the creation process. 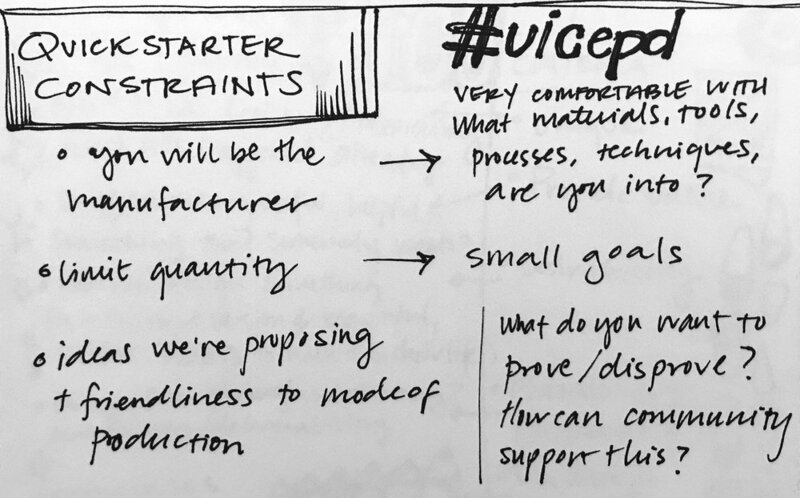 In the first Entrepreneurial Product Development class of the year, Professor Ted Burdett let us know that we would soon be launching our own Quickstarter project on Kickstarter. A Quickstarter is a “creative prompt aimed at starting small campaigns,” and often has a low funding goal and a limited campaign run time. The idea is to get people to try out quick, fun, and creative projects that they’d like to share with the world. Class notes on Quickstarter campaign constraints. Follow #uicepd on Instagram for project updates! We started discussing concepts and constraints in the first class, in addition to thinking about audiences and communities that our projects might have traction within. It was compelling to hear about my classmates’ diverse interest areas and the communities that they are a part of. One piece of advice that Ted gave us early in the process is that “you don’t have to listen to everybody.” While this is a simple statement, and technically something most of us know, it’s an excellent thing to be reminded of. It can be easy to end up as a puppet being jerked around by others’ opinions when you are tossing ideas around and seeking inspiration or feedback. In this light, it’s important to seek input from those you trust, respect, and those who you can speak freely with.